This is another Discovery channel DVD with a range of production dates. Although the DVD is dated 2011, the three programs contained are from 1997 through 2009. The first, Dinosaurs: Perfect Predators, came out originally in 2009, so it is not too dated. However, it is totally unclear from the DVD that the three predators featured did not all live at the same time. T-Rex lived at the end of the Cretaceous, around 67 to 65.5 million years ago. Quetzalcoatius arrived a little earlier, though both were caught by the K-T extinction event 65.5 million years ago. Deinochychus, however, lived from 115-108 million ears ago in the early Cretaceous. It is also worth pointing out that though Deinochychus (terrible claw) was 3 meters long, its back was less than a meter high, its weight was about that of a man, and it quite possibly had feathers. That does not mean it was other than a terrifying predator, especially in a pack. The third program, Beyond T-Rex, is quite old by dinosaur program standards and is focused mainly on paleontology. The “theme,” whether or not the discoveries of two large predators in the southern hemisphere “dethrone” T-Rex, struck me as rather silly. Yet in spite of its age (1997) this is probably the best of the three programs as far as paleontology is concerned. The two dinosaurs discussed are Carcharodontosaurus (sharp-toothed lizard, apparently native to Africa)) and Giganonosaurus (giant southern lizard, Patagonia.) The two are very similar, and are much more closely related to Allosaurus and each other than they are to Tyrannosaurus. In fact, they are so similar that their distribution has been used to argue that there was still a land bridge between South America and Africa in the early Cretaceous, when these giants were alive. No mention is made of feathers, which is hardly surprising given the date of the programs, well before the feathered dinosaurs of Mongolia were discovered. The history of Carcharodontosaurus is intriguing. The first specimens were found by German paleontologists before WWII, but were lost to allied bombing. More fossils were discovered in Morocco in 1995, and this material is the subject of the program. The casting of the skull is of considerable interest, as is the part of the DVD dealing with the rediscovery. The discovery of Giganonosaurus in Patgonia is covered as well. 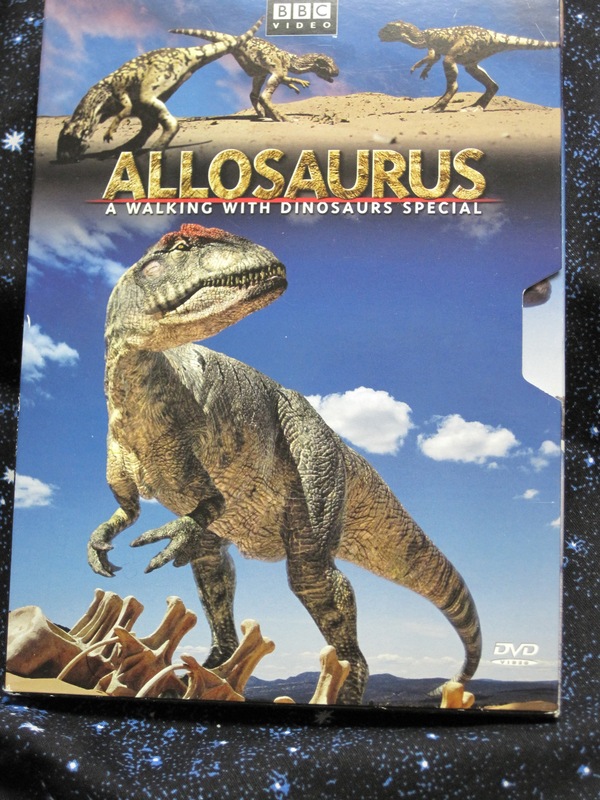 Here a better idea of the live animal can be obtained from the BBC DVD, Chased by Dinosaurs, as one of the episodes involves a pack hut of Argentinosaurus by Giganonosaurus. 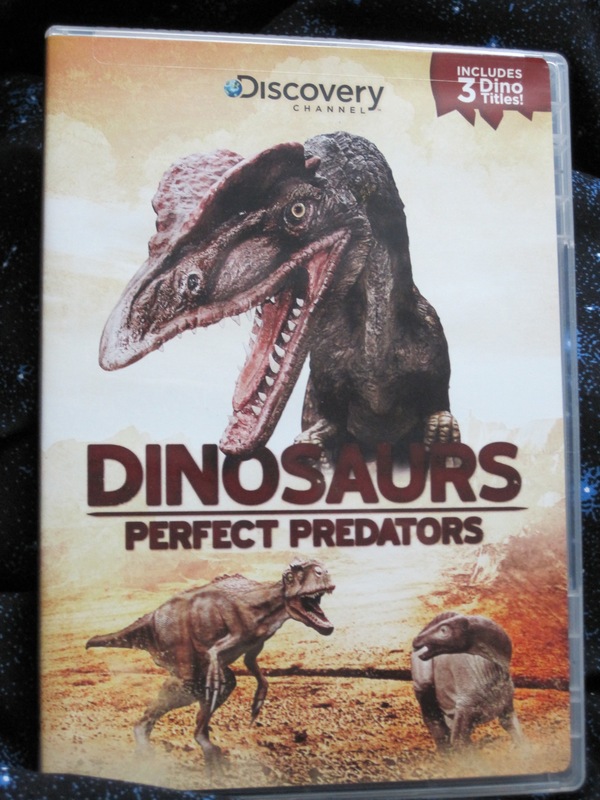 As a discussion of dinosaurs as predators the DVD is rather incomplete, especially the first two episodes. It may be worth getting if you want a complete collection of dinosaur videos. Dinosaurs in the Arctic? I live in Alaska and know several geologists, so I heard about the dinosaur bones on the North Slope almost as soon as they were rediscovered. 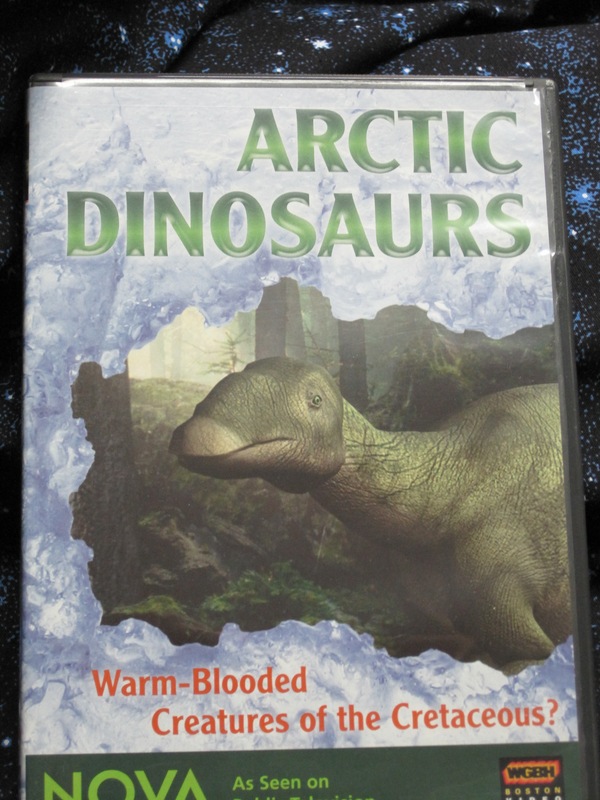 My first reaction, years before this DVD was made, was, “what was the latitude at the time the dinosaurs lived there?” After all, the fossils were about seventy million years old, and plate tectonics has reshaped the continents and oceans considerably since that time. At first, the answer was “it hasn’t been checked yet,” but when it was checked, it turned out that the fossil location was even closer to the pole that it is now: probably at around latitude 80°. Rediscovered? Turns out the bones were discovered clear back in 1961 by a Shell Oil geologist named Robert Liscomb. He sent them back to Shell, but when he was killed in a rockslide the following year, the bones were forgotten in the Shell archives. It was not until well into the 1980s and renewed interest in petroleum on the North Slope that the bones were sent to the Geological Survey, where they were first identified as being from a dinosaur. None of which answers the question of how dinosaurs managed to live at a latitude where there was no sunlight for four months of the year, and no night for another four. This DVD focuses on two questions. First, it examines the digging of a tunnel into the permafrost along the banks of the Colville River in an effort to find bones that were not broken up by freeze-thaw cycles. Second, it speculates on how dinosaurs managed to survive so near the pole. Were they migratory? What did they eat, especially in the winter? What ate them? What was the climate like? What does the discovery of dinosaurs at such a high latitude suggest about whether dinosaurs, like their bird descendants, were warm-blooded? Certainly there is evidence for a climate far warmer than today’s on the North Slope, even though the latitude was higher. There is no evidence for sea ice that far back, and an open ocean would have made for a much warmer climate. But plants could not have grown without sunlight, so what did the herbivores eat? Moose today winter on bark and twigs – they certainly nipped all the buds off of my Amur maple last winter, and when I had a crab apple tree, it got smaller every year as the moose nibbled its twigs over the winter. Could dinosaurs have done the same? Although this video does have some dinosaur animation of reasonable quality, it is of interest primarily for what it reveals about dinosaurs and their fossils. It was originally a TV program, from PBS on Nova. Get it for information, rather than entertainment. 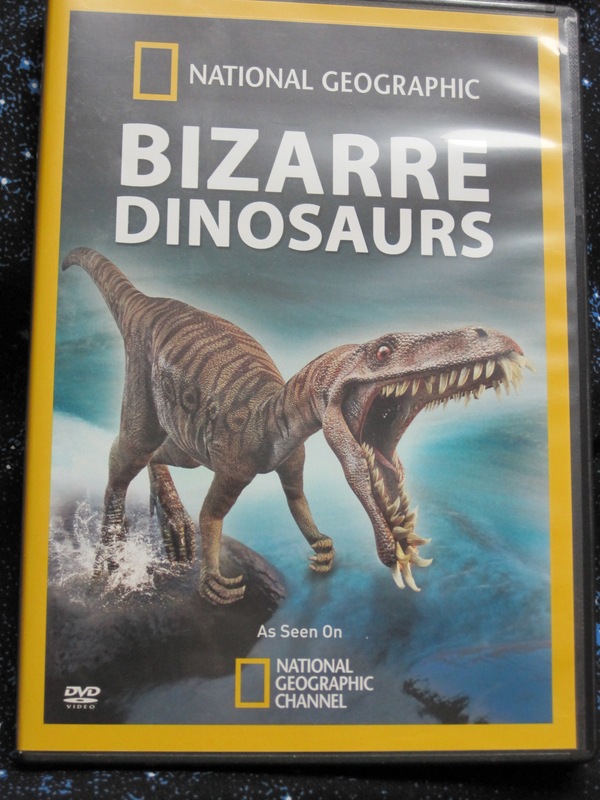 This set of two DVDs, although the cover has a date of 2008, in fact combines episodes originally aired on the Discovery Channel from 2001 to 2008. 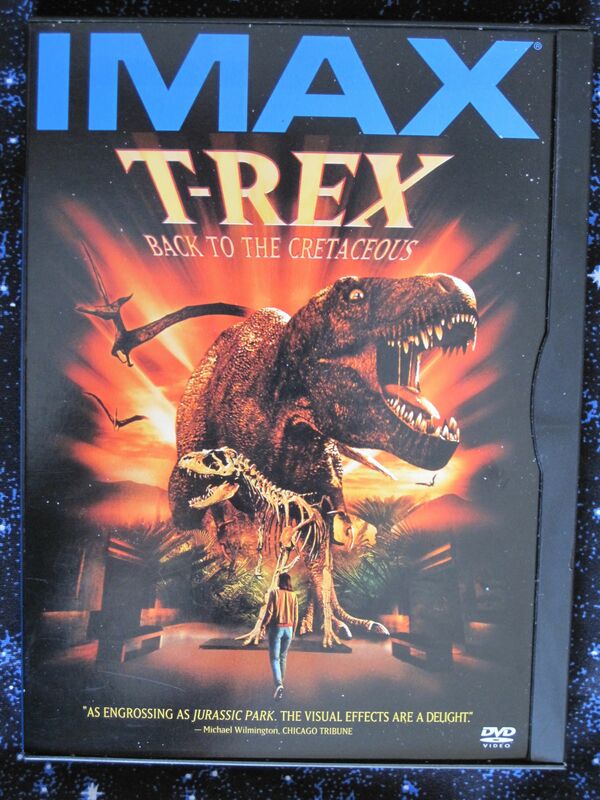 The first disc contains four episodes: Valley of the T. Rex (2001), T-Rex: New Science, New Beast (2006), When Dinosaurs Roamed America (2001) and Utah’s Dino Graveyard (2005). Keep the true dates straight, because our interpretation of dinosaurs is changing rapidly, and the episodes at times seem to contradict each other. None of the interpretations are truly currant, or represent today’s ongoing controversies. This DVD focuses on the processes of finding, unearthing and interpreting fossils, with only minor clips of computer generation of the living animals. It will be of more interest to budding paleontologists than to those looking for entertainment. Valley of the T-Rex looks at the idea put forward by Jack Horner that T-Rex was primarily a scavenger, not a predator. The idea is hardly new, and is far earlier than the discovery of T-Rex’s tiny arms – Wiley Ley proposed it as a science article in the April 1943 issue of Astounding Science Fiction. I really doubt that there is any such thing as a pure predator or a pure scavenger. Any predator will scavenge a fresh kill, and any scavenger will kill an animal down and helpless, if only by eating it. Like the short-faced bear, T-Rex may have used its impressive size to intimidate other predators off their kills, but that doesn’t mean it never killed. T-Rex: New Science, New Beast is more balanced, mentioning that how T-Rex fed is controversial but not getting into the controversy. Rather, it summarized new (as of 2006) methods of investigating dinosaur fossils. This included learning how to tell how old fossil dinosaurs were at death (which led to the discovery of the fantastic teenaged growth spurt of T-Rex and the relatively young age (29) of Sue, the largest T-Rex found.) At least one dinosaur was sexed, though the technique only works with pregnant (with eggs) females. Study of locomotion in modern animals has been applied to dinosaur skeletons, suggesting a lower top speed for full-grown T-Rex than was previously estimated. The episode also mentioned the discovery that some fossil bone had collagen, study of T-Rex bite strength, and the discovery of feathered theropods, leading to the possibility that T-Rex juveniles, at least, had downy feathers. When Dinosaurs Roamed America goes through the history of dinosaurs, using an American location to spotlight each time period. Remember this segment, and the computer animated clips included, is eleven years old in 2012. The video starts with New York (Permian-Jurassic, first dinosaurs, early opening of the Atlantic.) It then moves on to Exeter Township, PA (Triassic-Jurassic boundary, theropod-sauropod split.) Utah was a savannah 150 million years ago, wandered over by giant sauropods, their predators, and the smaller herbivorous dinosaurs that survived at their side. New Mexico 90 million years ago was a tropical swamp, with an explosion of flowering plants and broadleafed trees. The notorious K-T (Cretaceous-Triassic) boundary and the final extinction of the dinosaurs is investigated in South Dakota. The video is not bad, but dated. The final program, Utah’s Dino Graveyard, covers a single location with a huge number of dinosaur fossils of a single species. Falcarius Utahensis was a strange beast even by dinosaur standards, as are most of its Therizinosaurian relatives. It is one of the earliest of a group that evolved from raptor-like carnivores to big-bellied but still relatively upright herbivores. This does happen – all dinosaurs, even the huge sauropods such as Apatosaurus evolved from early ancestors that ran on two legs and preyed on insects. More recently, the giant panda seems to be a bear that has embraced a diet of bamboo. The real question is, what killed large numbers of the same species? Their preservation seems to be due to the fact that they all died near ancient springs, with rock from the spring deposits forming a cap that preserved their bones, but could the spring also have played a role in their deaths? In general the computer graphics are adequate but not inspired, and at times show behavior I have doubts about — but I’ll save that critique for the second disc. This is actually a reissue of programs aired on the Discovery Channel in 1997, though the DVD has a 2009 date. 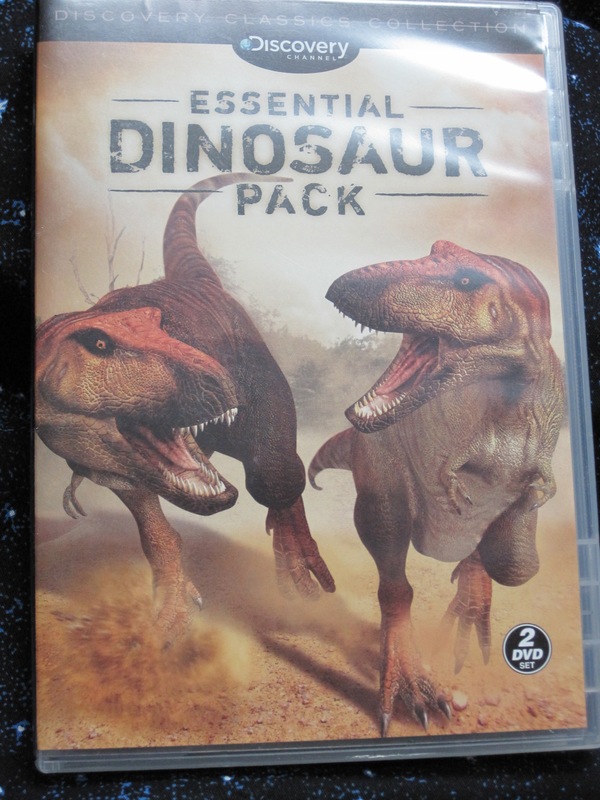 The package date is very misleading, as both the facts given and the computer animation are 15 years old – before the first airing of Walking With Dinosaurs. The computer animation, in particular, is very poor, and I would certainly not buy this DVD to watch the dinosaurs! The DVD includes four 1-hour programs: Renaissance of the Dinosaurs, Land of the Giants, The Killer Elite, and And Then There Were None. In order, they deal with the public fascination with dinosaurs, the large herbivores, the two-legged killers such as T-Rex and raptors, and the extinction of the dinosaurs. Luckily, the program concentrates not on the videos, but on the science of paleontology. Even that is a bit dated in describing what is known about dinosaurs, though the finding, excavating, packing and cleaning of specimens is worth watching for budding paleontologists. So is the history of our fascination with dinosaurs, including more than the usual information about how our views about dinosaurs have changed since the Crystal Palace reconstruction and the dinosaur wars between Cope and Marsh. If you are looking for a video to entertain children, this is not it. On the other hand, the DVD does have a number of airings of scientific controversies and field operations. One point I would disagree with. The question of whether dinosaurs resembled birds or reptiles in care of young is addressed by using fossil bone cross sections to determine whether newly hatched dinosaurs had strong enough legs to stand. I strongly suspect that some dinosaurs could stand and some couldn’t, and the same is true of modern birds. Certainly chicks and ducklings are on their legs and finding their own food almost at once, and I suspect at least some dinosaurs may have been the same. I have seen arguments in later DVDs that some pterosaurs (which admittedly are not dinosaurs) were able to fly shortly after hatching. All in all, this is not a DVD I would consider entertainment, but it could be of interest to a budding paleontologist. This is the first of a number of reviews of National Geographic’s DVDs on prehistoric animals, so I will start out by saying something that applies to all. They are very good in interviews with actual paleontologists. The computer graphics of the extinct animals are of moderate quality, and there are only a few clips repeated over and over again. These videos are excellent for budding paleontologists or those actually interested in the science of how we know about extinct animals, and are better than series like “Walking With Dinosaurs” in that they allow scientific arguments to be heard. They are not in the same league when it comes to the re-creation of the extinct animals. 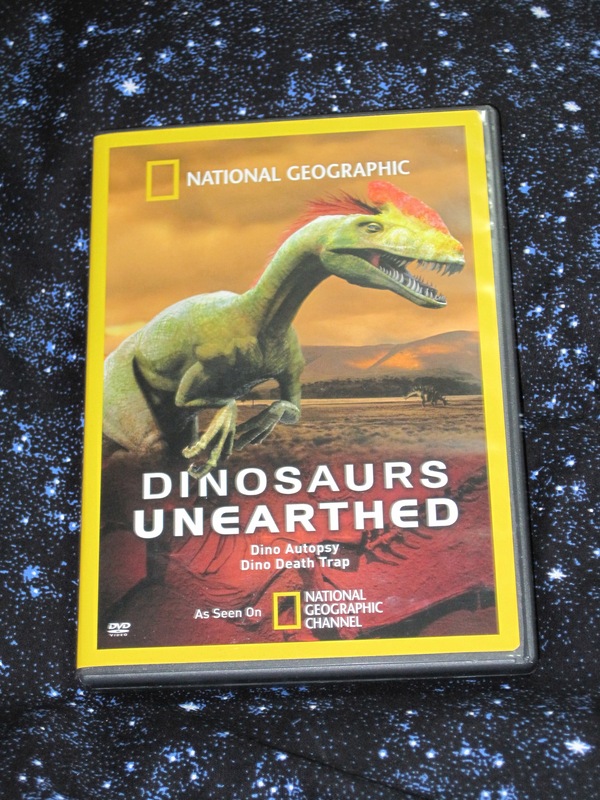 This DVD contains two programs originally shown on the National Geographic channel: Dino Autopsy and Dino Death Trap. The first is about a rare fossilized mummy of a hadrosaur, nicknamed “Dakota,” found in the badlands of North Dakota. The fossil was found in 1999 by a teenaged paleontologist, and has supplied information on skin texture and musculature of hadrosaurs. The science is fascinating. The quality of the animation is somewhat less so. The second program involves the excavation of a site in China. This site produced a number of near-complete skeletons from a period, the Late Jurassic, very poorly represented until now. Most of the attention is given to Guanlong, a very early form of tyrannosaurid. The skeletons are in three dimensions rather than flattened, which has been interpreted as evidence that they were trapped in soft sediments, and lie above each other in a vertical column. There is speculation about how they died included in the video. Was a volcanic eruption to blame? Was the mud in which they were trapped due to volcanic ash falling into a marsh? Also, while these animals are the early forms of species known from the Cretaceous, the Cretaceous forms were giants, and these animals are relatively small. Guanlong’s back would about reach the waist on a standing human, yet it is an early relative of Tyrannosaurus Rex. What caused the increase in size? Did guanlong really have feathers as part of its crest? They are in the computer animation, and a relative, Dilong, is known to have had primitive feathers. The crest does appear to be a display organ (relatively thin and brittle) and feathers would have made it more conspicuous. 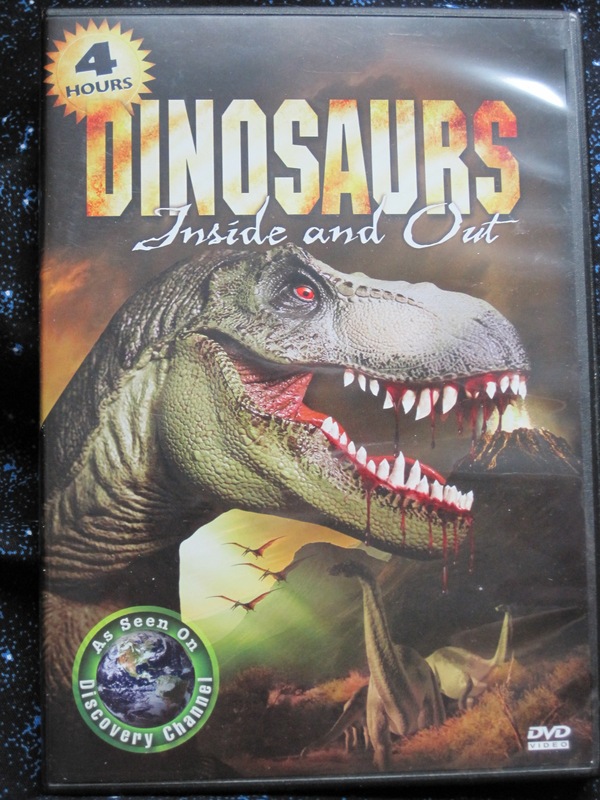 Overall the DVD is worth watching if you are really interested in dinosaurs. If you are looking primarily for entertainment, others are better. Here, all in one place, are links to my reviews of some of my favorite DVDs. This list will be linked from the Index page, and I’ll be adding to it as new DVDs are reviewed.